At Cape Coral Screen & Vinyl, we have offered reliable customer service to Lee County and the surrounding areas. We are committed to excellent service when it comes to all windows, doors, garage screens, patio installation and repairs. Earning our clients trust and confidence since 1982, we ensure an affordable service that you can rely on when you need it the most. For over 30 years we have provided custom screen enclosures for all patio and garage needs. For all installation and repair needs of windows, doors, garage screens, and pool cages, we offer a wide variety of affordable services. We are committed to achieving the highest quality of service and have earned a reputation for putting our clients' needs first. Our skilled experts at Cape Coral Screen & Vinyl can change the atmosphere of your patio and home. Perhaps you want to capture your vision of the perfect tropical oasis, or simply want to replace your neighbor's unsightly house with the ideal view? 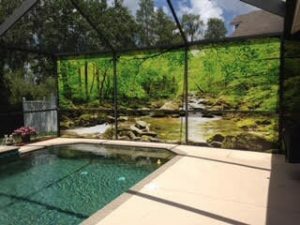 Installing the right pool cage and screen enclosure is made easy with Cape Coral Screen & Vinyl! As a leading and established acrylic and vinyl installer, we can transform that exterior living space from a beginning design concept to the finished desired dream enclosure meeting all your needs. Our passion is to provide any and all affordable installation and repairs for windows, doors, garage screens, and pool enclosures preserving your private paradise. At Cape Coral Screen & Vinyl, we're well known for performing quality acrylic and vinyl window installations and repairs. We offer screen repair and installation for windows and patio screen doors as well. By providing our clients with this wide variety of services, we are ready to satisfy your needs. While there are other contractors available to repair windows and doors for you, we strive to stay one step ahead of the competition. We can do this thanks to the guidance that we receive from our former owner Rick Dean. He has been working in the aluminum industry since 1973, learning many helpful skills that he has passed on to the rest of the staff. We stand behind all the work that we do and only use high-quality materials. Call us at (239) 574-5557 or email Sales@floridasbestaluminum.com for more information. Don’t forget to ask about our garage screens and pool cage installation services!